With the Web Forwarding product, you have the advantage of making multiple websites that look like a single website. You can register misspellings, alternate extensions, such as .org, .net and abbreviations that forward to your primary website. 1. In the Account Manager, select My Domain Names. 2. Select the domain name you want to change, then click Manage. 4. 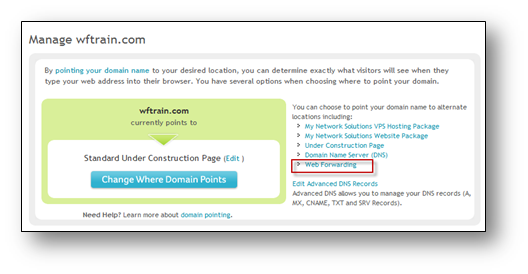 Select Web Forwarding, then click Continue. 5. In the text box, type the destination URL where you would like your domain name registration to forward. 6. Click the checkbox next to Mask Destination URL if you want to turn on masking, then click the Continue button. 7. Click Apply Changes to confirm the changes. 8. You have set up the Web Forwarding service for your domain. Network Solutions—How Do I Enable My Domain Protection? Network Solutions—What is Private Domain Name Registration? What Is Automatic Renewal?